As a CBD and instructor I’m happy to announce the third year the Certified Business Developer curriculum is being offered. Once again it is provided by the Business Development Guild in collaboration with the ASU Ira A. Fulton Schools of Engineering. 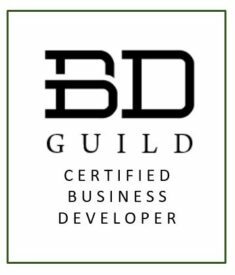 The Certified Business Developer (CBD) curriculum is a critical element in training current and the next generation of Business Development (BD) professionals. The curriculum is designed to take you, the BD professional, and your organization to the next level. This is the third year this program has been presented. Seating is limited, we encourage you to register now.